Signs are called "Rashis" (raw-shees) in Sanskrit. This table shows the signs with their rulers, Sanskrit names and symbols, etc. As you can see, the signs are the same as used in Western astrology. However, the nature of the signs, what they do, and the demigods behind them, who control them, are vastly different in Vedic astrology. Note: Vedic astrology differs from Western or Tropical astrology mainly in that it uses the fixed zodiac as opposed to the moving zodiac. Most people's "Sun Sign", that which you can get from the newspaper each day, is usually one sign back when the chart is refigured using Vedic astrology. So, the first surprise using the Vedic system is that you are no longer the Sun Sign you always thought you were. 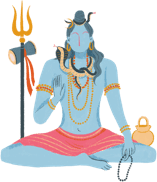 However, if you were born in the last 5 days or so of the Western sign month, then you will probably still be the same sign in the Vedic system.